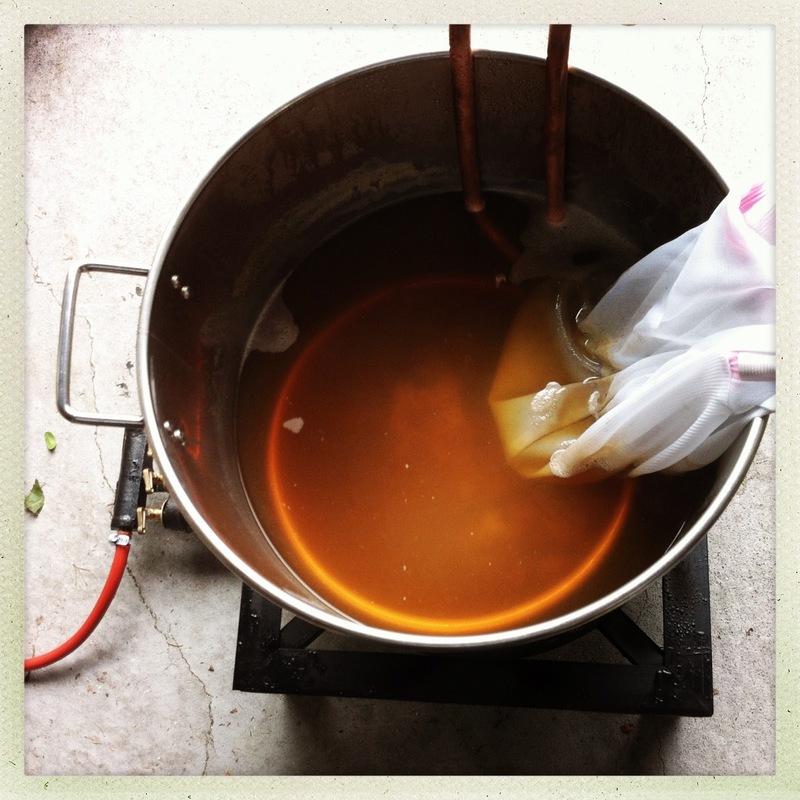 Scientician: Adventures in All Grain Brewing. Boring description of what I did follows. 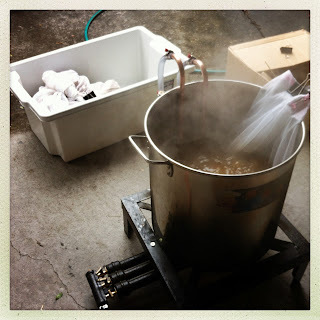 Adventures in All Grain Brewing. Boring description of what I did follows. 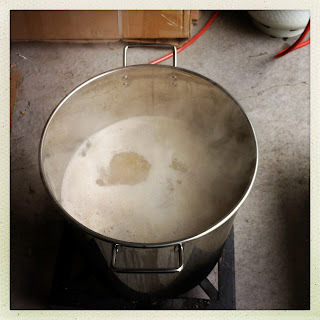 So all grain brewing is a new and terrifying experience, I bought some software, Beer Alchemy, but honestly it isn't helping. I found a well recommended yet basic recipe on the net and went from there. Centennial Blonde Ale calls for 2 row malt, which we don't see much of here. After reading up on the forums it seems that Americans use it as a base malt because its cheap, available and doesn't add a lot of flavour. We have access to a lot of UK pale and NZ pale malts here. Apparently they have a little more flavour so you don't need to add as much speciality malts. But once again, thats only what I could glean from reading online forums. Anyway I had 4.05kg of grain total and about 20L of water preheated to 70. I turned off my flames and dropped in my cake rack (round made of sturdy wire to stop the bag hitting the bottom) lined the pot with my grain bag and tipped in the grain. Mmmmm smells good. Had to stir for a bit to smash up some dough balls. I was aiming for a mash temp of around 66 and I got about 65.8 (HAH yeah, my thermometer is THAT accurate....not). So I wrapped the pot up in an old polar fleece blanket and left it for an hour. When I got back the temp had only dropped a degree so that was cool. 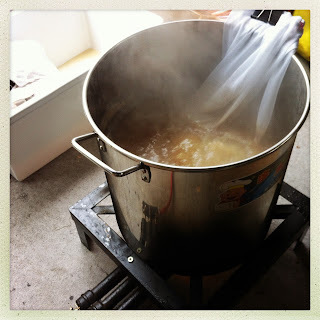 I turned the heat back on to warm it up for mash out, The I pulled out my bag and twisted the top until I had a nice tight ball of grain at the bottom, this was set over to pot on a wire rack to drain into the pot and 4L of approx 70 degree water was poured through to rinse out and remaining sugar. I did my boil and added hops (via hop bag) at all the right intervals, even added some Irish Moss for clarity and chilled it down with my wort chiller. I though I had at east half a pot of wort there but when I poured it into my fermentor I only had 12L! (I did leave most of the sludgy stuff behind) But the gravity was up to 1.06 I was aiming for 1.04 so I topped up to 18L with water and was bang on. There is so much more gunk when going all grain. I need to probably whirlpool and siphon to leave more crap behind. Of course I decided I had things under control in the last 45 mins of the boil and decided to have a beer or two. That did not leave me very motivated for clean up, but grains and hops are in the compost and everything else is rinsed out. My Chinese market three ring burner had left carbon all over the bottom of my brew pot and I even up with greasy black fingers after pouring the wort out. But at least its grunty enough to get it up to a rolling boil. I think it was boiling a bit too vigorously though, I had it fine tuned about halfway through to a nice gentle boiling instead of the erupting boil. The wort tasted good though and thats the main thing. Wort just starting to boil. 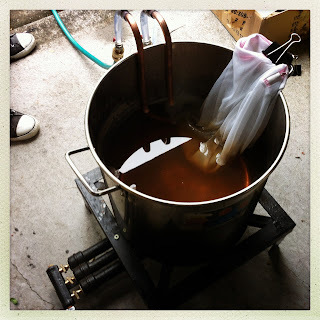 Wort boiling away with my hop bag clamped to the side.